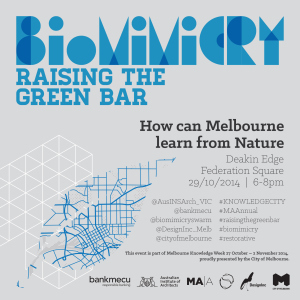 BiomimicrySwarm Australia is hosting a multi-disciplinary panel discussion on ‘How can Melbourne learn from nature’ to create a sustainably regenerative and generous city. This event is part of Melbourne Knowledge Week and Melbourne Architecture Annual, in partnership with the Victorian Chapter of the Australian Institute of Architects and DesignInc. There will be refreshments and networking after the panel discussion for the conversation to continue. This event also goes under the banner of Raising the Green Bar, an ongoing series of activities to raise awareness of sustainability, organised by the Sustainable Architects Forum and sponsored by Bank MECU.